Sometimes, I like to stroll around my neighborhood and gaze at the front of all of the homes in my area. It’s fun to see who updated their landscaping this summer, whose weeds are out of control, and who decided to paint their home a wacky color. While I can’t see the inside of these homes, I definitely get a sense for the family’s style and how much pride they take in their home just at a quick glance. 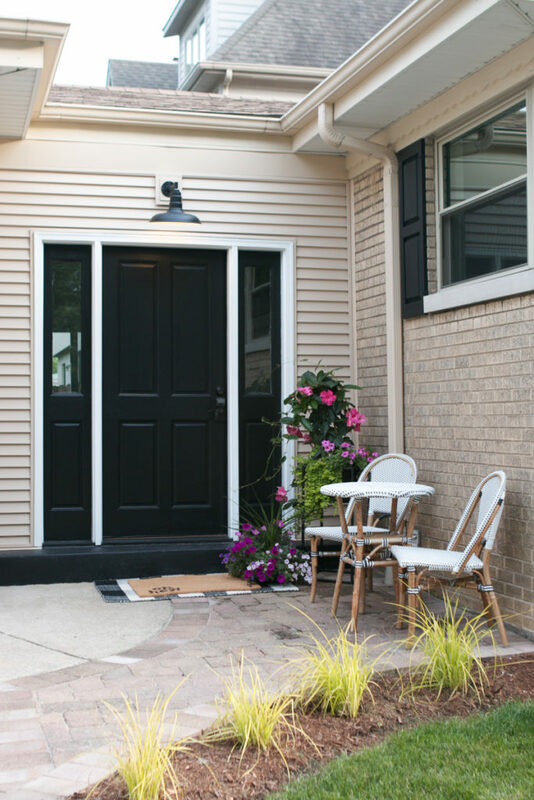 If the outside of your house is looking less than desirable, there are some simple updates you can do right now to improve your curb appeal. 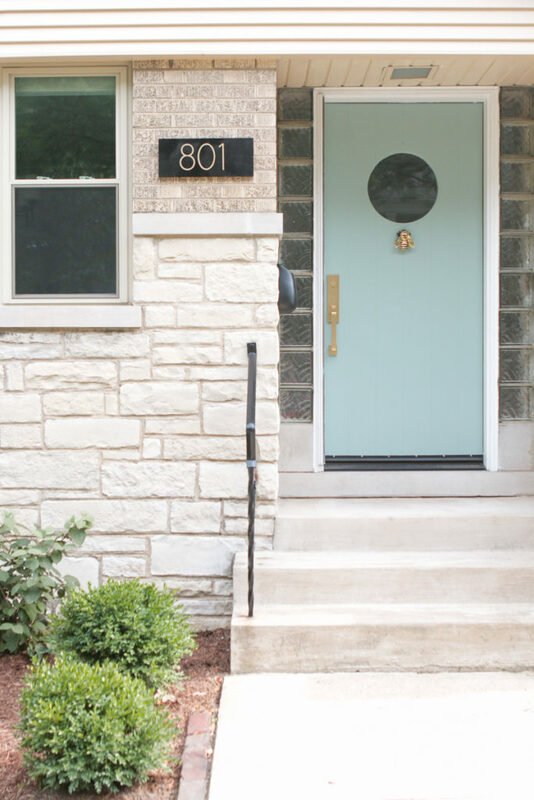 This past summer, I overhauled the exterior of my entire house (you can read all about it right here) and it’s looking 110% better. I’ve documented the DIY projects I pulled off to take our curb appeal to the next level. If you have the budget and time, nothing changes the front your home like a totally new color. Truthfully, I’m not in love with the beige color of the outside of our home. When we first moved in, I looked into hiring a team to paint all of that beige brick to white. Sadly, the quote came back at $15,000 … YIKES! Looks like the beige will stick around for a while longer. But even if you can’t fit the bill or paint the front of your place yourself, there are still other areas you can paint on the outside of your own home, which we’ll discuss below. 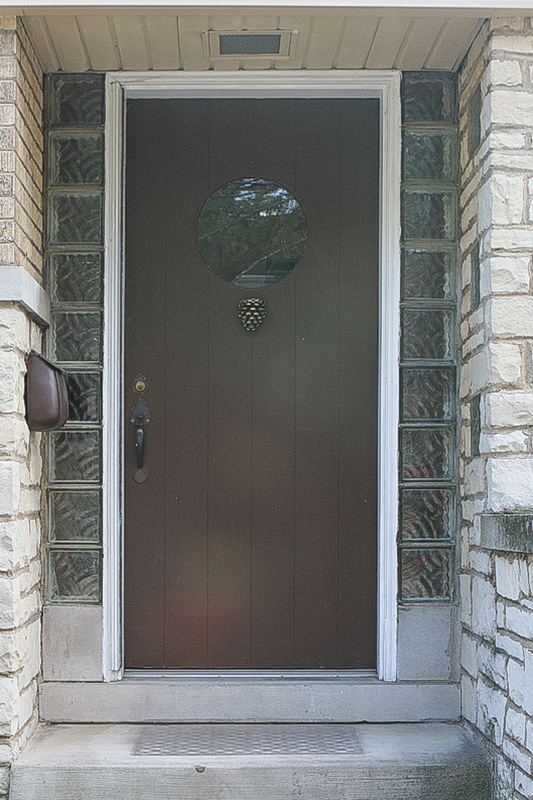 Your front door can make a huge difference. 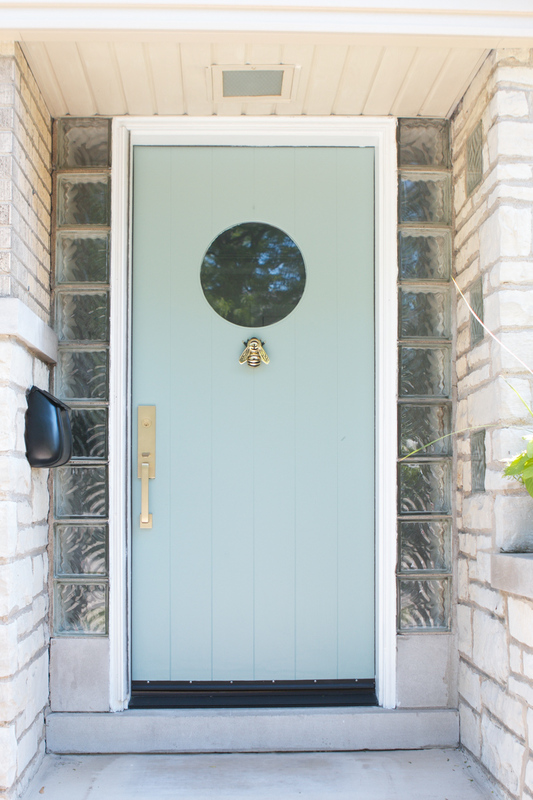 Our front door was a faded brown color before I decided to brighten things up by painting it a pretty light blue. (The official color is actually called “Stratton Blue”.) I also added a new door knocker that reflects our style and family personality (yep, it’s a gold bee!). Painting the front door only took me a few hours and my entire house instantly looked happier. 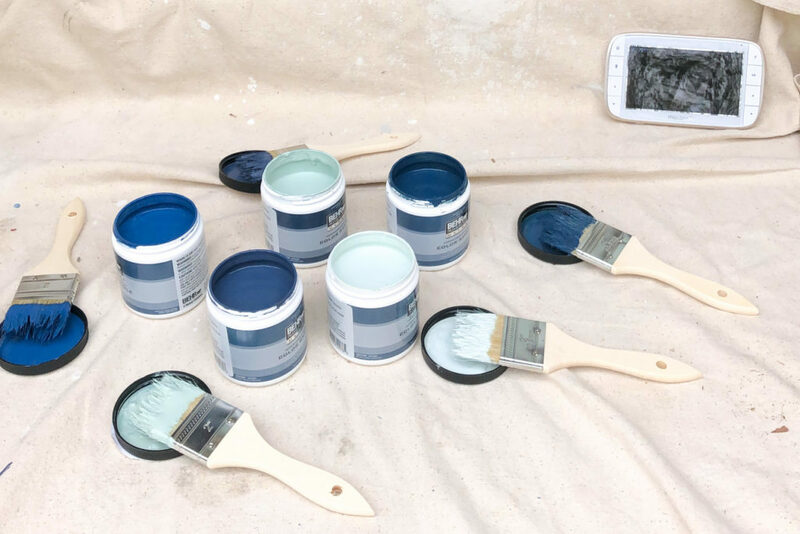 Want to paint your front door? 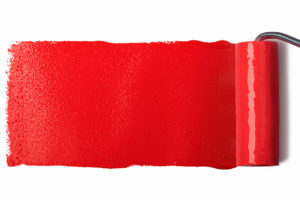 Be sure to check out this tutorial with 5 tips to get a long-lasting finish. While the front door added some much-needed color to our home’s exterior, there was another area in serious need of some TLC: our garage door. The brown paint was peeling and faded, and it was begging for some attention. Plus, garage doors are one of the biggest indicators of a house’s resale value. I had never painted a garage door before, but I’m happy to announce that it was one of the easiest DIY projects I’ve ever tackled! 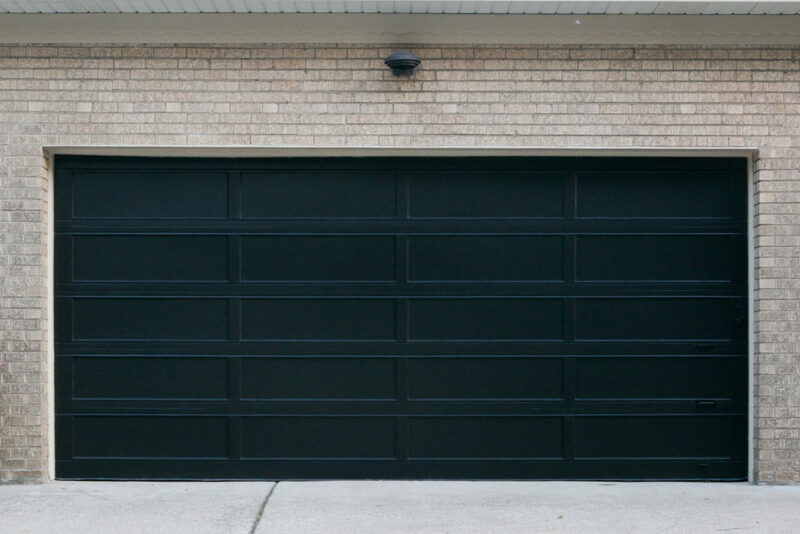 Two coats of the color “Tricorn Black” later, and now I don’t cringe every time we pull up to our house to enter the garage. Still a little unsure about your painting skills? 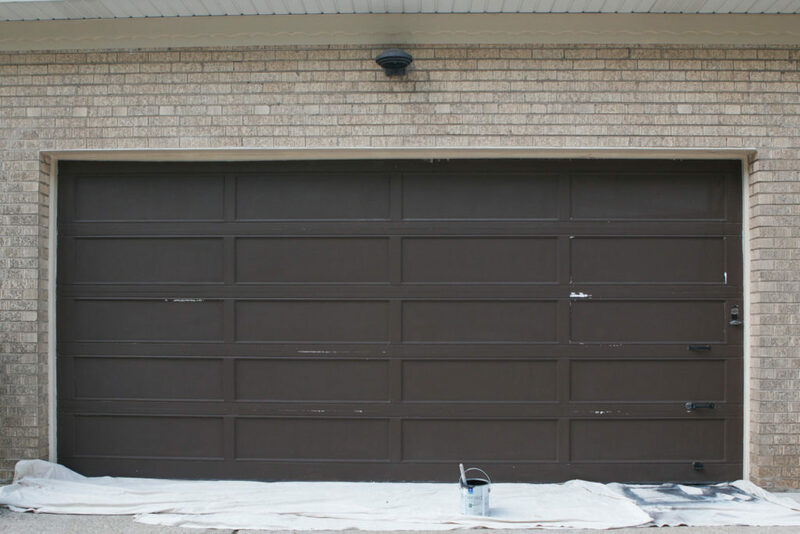 Here are some of our tips for painting your garage door. If we had a porch on our house, I would without a doubt add a porch swing. There’s just something so cozy and homey about this exterior addition. I like to picture myself swinging away in the morning while sipping my coffee and leisurely watching the rest of the neighborhood stroll on by. 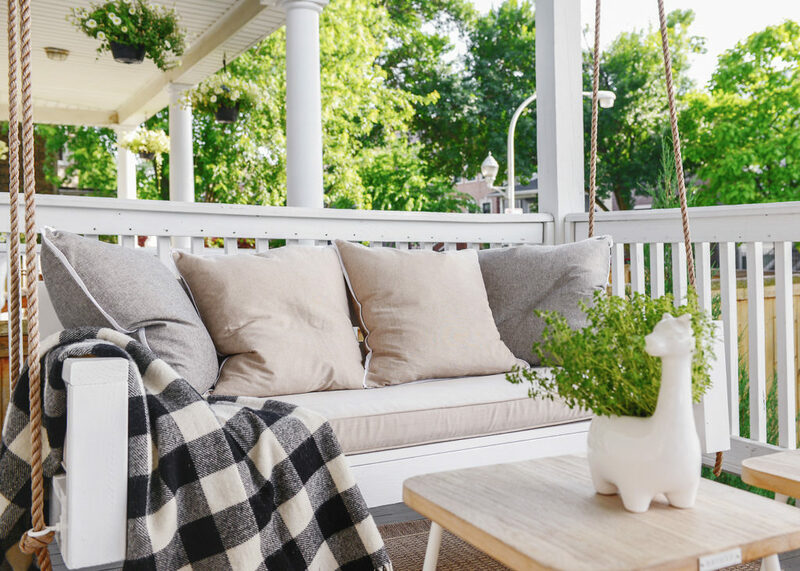 However, our friends Kim & Scott from the blog Yellow Brick Home did add a DIY porch swing to their Chicago porch. They built the entire thing from scratch and let me tell you, it adds so much to their home’s vibe. The monetary cost? Only about $100, and it was a total facelift to their place. You can DIY one yourself by following their tutorial, or if that’s a bit too advanced for you, consider buying an inexpensive swing (like this one) and installing it yourself. Take a look at the lighting on the outside of your home tonight. Do your fixtures emit enough light, or does the outside of your home look dark and scary? Maybe your fixtures are a bit weathered and outdated? If so, then simply upgrading them may be the perfect way to improve the exterior of your home. Exterior lights don’t need to be super expensive (here’s a great list of fixtures all under $200) and you can install the new ones yourself to save even more cash. This video tutorial breaks down the process to replace your exterior lights with new and improved versions! Oh, and don’t forget string lights! Both of us have string lights on our patios to emit a soft glow at night. You can just buy a plug-in timer (we use this one) so they go on and off every evening. 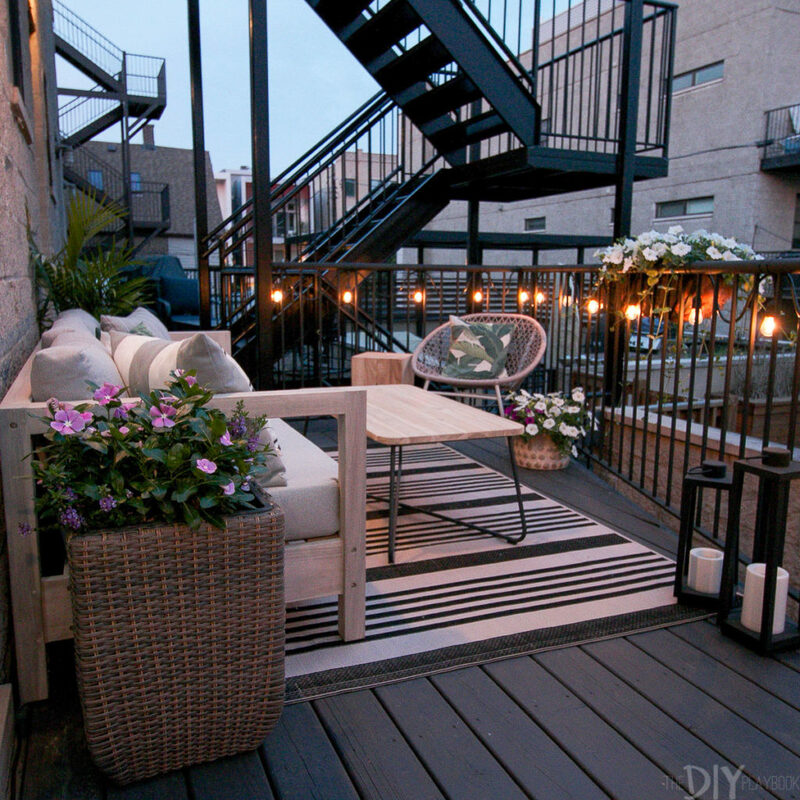 Why not bring that fancy bistro feel to your own patio?! 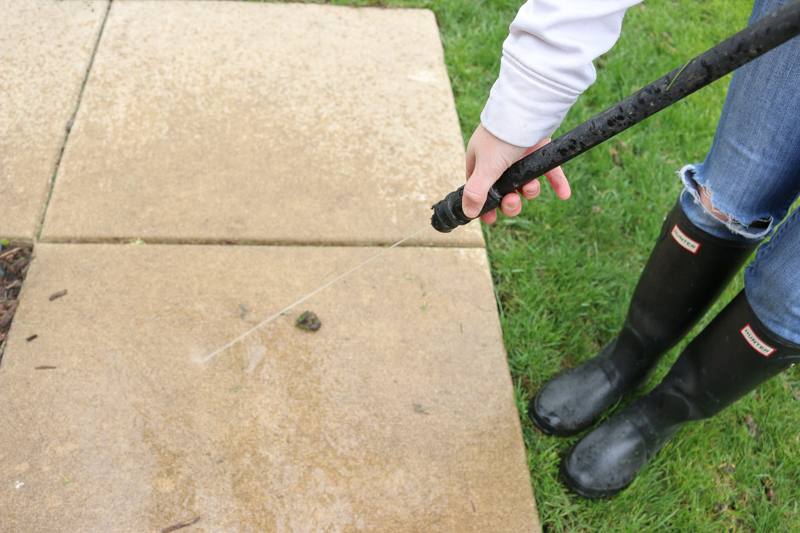 This is by far the easiest DIY project out of the bunch … rent a power washer and go to town cleaning the outside of your home! I can’t tell you how amazing it feels to see all of the dirt and grime wash away. I power washed our driveway, the steps leading up to our house, and even some areas on the exterior of our home to get it looking clean and new again. You can follow these steps to get the job done right. It will only cost you about $30 to rent a power washer for the day, so schedule a day to get this project done and I promise you’ll be happy with the results! Oh, and don’t forget to wear rain boots and ragged clothes. It’s a fantastic protip, but you will be filthy by the end of this project. It’s the small details that really take your curb appeal to the next level. Upgrading your address sign is one of them. I’ve changed up this small detail at every home I’ve lived in, and it made such a big difference. You can purchase a modern address plate, but honestly? We suggest making your own. How did I make mine? I took a piece of wood, some inexpensive numbers from Amazon, and a few extra supplies, then put together this cool address plate for the outside of our home. It only took me an afternoon and our house was instantly chic! Here’s the tutorial to create your own modern address sign. Don’t worry, there’s still plenty of time to take the outside of your home to the next level. Take a few weekends this fall to get your house looking nice and upgraded (before the dreaded winter arrives! ).